Rhino News, etc. : VisualARQ 1.0 is shipping! 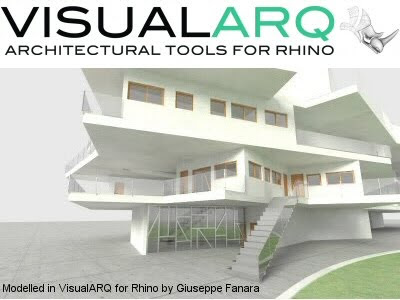 Designed for architects, planners, and interior designers, VisualARQ (developed by Asuni CAD) is a Rhino plug-in for creating and editing architectural models. It adds parametric 3D objects like walls, columns, doors, windows, and stairs that are suitable for 3D modeling and 2D documentation. As a fully integrated plug-in for Rhino, VisualARQ offers a set of architectural tools that make the design and documentation process faster and easier and a feature-based editor that lets you easily create and edit custom architectural objects. VisualARQ integrates intuitively in the architectural design workflow with the shortest learning curve and at a very affordable price. A set of architectural tools to streamline the design process, including a powerful feature based editor to easily create and edit parametric architectural objects. User-friendly wizards, dialogs, and toolbars. Customization options for VisualARQ objects. Tools to create 2D documentation, including sections, opening elevations, schedule tables and area calculation. A Floor Manager and other useful tools to work with multistory models. A library of standard architectural objects and structural profiles. Savanna3D: A library of over 1000 detailed Rhino blocks with various collections of commonly used objects. Support for any render engine that works with Rhino 4.0. VisualARQ 1.0 is available in six languages (English, Spanish, German, French, Italian, and Czech). Introductory offer (until January 1, 2010): US$/€395. Educational license (for students and teachers): US$/€195. Lab license (for schools): US$/€675. VisualARQ 1.0 is available worldwide and delivered as a physical product. To purchase VisualARQ 1.0 or download an evaluation version, visit http://www.visualarq.com/.